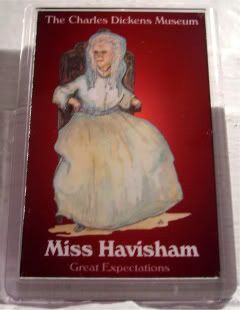 A friend of mine brought me this magnet from the Charles Dickens Museum in London - it was one of the museums I missed out on last year. At the risk of sounding a bit like Miss Havisham, I've learned a few things this week. I've always known that I don't want kids. I'd screw 'em up too bad, they're too much responsibility, and I don't want any of that. And, after helping shepherd 1,200 second to eighth graders last Wednesday, that's pretty much confirmed now. I mean, I really love kids a lot, and they generally love me. But, I have to be honest, my favorite time with them is actually giving them back to their owners. The no kids rule is fine, because I've pretty much always known that I don't want to ever get married, either. Just not going to happen. There are a million reasons why not (maintaining my independence first and foremost), but this is a magnetblog, so I won't get into it. Before these last two days with Erik Estrada, there were a few exceptions to that no marriage rule. I maybe would have said yes to George Clooney. However. After having watched Erik try to sit down to have a simple meal, but be constantly interrupted and accosted, George doesn't have a chance with me. I'd want to build a fence around him.